We can assure you that camping in the Grand Canyon is far different than camping it in a forest. After all, you will be sleeping on a nice sandy beach, without being invaded by lots of insects and there is no mud or dirt at these campsites. While your talented guides are preparing the kitchen, you will be navigating the area looking for a brand new place to call home each night. There are no pre-designated or pre-planned campsites on a river trip, so your dwelling for the evening can vary in size and location. After the day?s activities, those capable of assisting will for a fire line and help remove bags and equipment off of the raft. These bags consist of the dry bags which you will be given during the duration of your river trip from your guides. These will carry your sleeping kit (sleeping bag, ground tarp, sleeping sheet and sometimes a pillow) as well as another dry bag which contains your clothing and personal products. In addition, you will have a separate day-dry bag which is smaller, and accessible all day long for things like spare sunglasses, sunblock etc. Tents are always available to you, they accommodate 2-persons at a time however weather permitting, it is recommended that you don?t always pitch a tent to sleep in. This unique environment and the lack mosquitos/bugs makes a night sleeping under the stars an incredible experience. Watching the moon dance across the canyon walls is a site unlike any other! Those who have non-motor rafts will likely sleep on pads because space is limited vs. most motor trips that do accommodate guests with a sleeping cot. The rest of the facilities including the kitchen and toilet or ?restroom? are set up by the guides, leaving you with plenty of time to set up your camp and relax while dinner is being prepared. It is incredible what amazing meals can be prepared by your guides each evening in these make-shift kitchens. An unlimited supply of fresh, clean water for hand washing and dish washing is available at camp as well as fresh drinking water available throughout your river trip at all times whether at camp or on the rafts. The toilet facility also knows as ?the groover? that will be situated as soon as you arrive at camp. You can be assured that your guide choose specific locations for privacy and sanitary reasons, and most times you will be rewarded with a great view while taking care of your business. A hand washing facility is found in the kitchen and at the entrance of the toilet. Soap is available, as well as running water through the use of a foot pump.Exploring around camp is not prohibited, but we have to remind our clients that accidents do happen when you walk barefoot or stroll around in the night without flashlights. Sandals, preferably with toe protection will protect you from unseen rocks, so wear them always. Evenings at camp can be some of the most memorable moments of your trip. Sharing food, spending quality time with family, lifelong friends or even newly made friends and while enjoying the outdoors is absolutely magical. This makes for a great time to bond and cherishes special moments together each night. After a good night?s sleep under the stars, coffee will be awaiting you first thing in the morning. 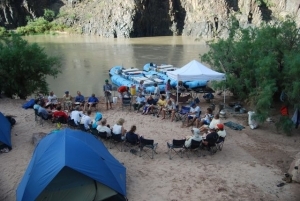 While breakfast is being prepared, you will begin packing your personal things so they can be loaded once more in the rafts for the new day of whitewater rafting in the Grand Canyon.